Many people enter into hot tub ownership with the intention of having a place to go and relax. Some intend to use it for therapy or relieving a specific ache or condition. And others, still, use their spa primarily for social reasons like entertaining or creating more quality time. Whether enjoying your hot tub for any of these reasons with a spouse, family, friends, or simply by yourself, the right accessories can enhance your experience. The best hot tub accessories can make all the difference between the average soak and the absolute best hot tub experience you could imagine. As you decide on which spa accessories to invest in, consider your lifestyle, your spa model, and what you want from your hot tub. Perhaps you’re looking to entertain guests and want superb sound. Or you may want a place with the right mood for meditation or an ultra-comfortable place to unwind and de-stress. And everybody wants their spa to be safe and easily maintained. To help determine which hot tub accessories best fit your lifestyle and meet your needs, we have developed this comprehensive list, categorized them, and provided descriptions of the benefits of each accessory. For many people, the hot tub is a place you go to relax after a long day. Comfort and usability is likely a key factor in creating your ultimate hot tub experience. The two most common considerations in this category are access and privacy. Are you looking for a quiet secluded experience, but don’t have a private spot in the yard? No problem, there’s an accessory for that, in fact, there are a lot of them. Privacy screens come in about as many types as you can imagine. Simple and inexpensive folding vinyl screens are an easy and portable way to block unwanted views. More permanent installations may incorporate privacy fencing or trellis materials. 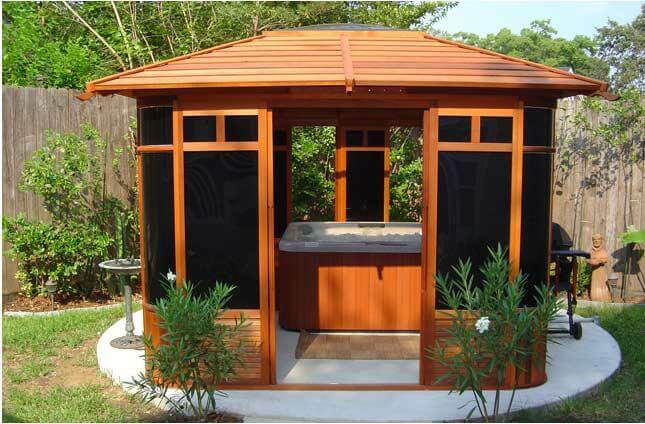 Or you may opt for something super fancy and functional like the Covana, which is an all-in-one automatic lifting hot tub cover and privacy shield that can be locked and raised an lowered by simply pushing a button. Key takeaway: Mother Nature can be harsh sometimes and the various elements can take a toll on your spa. Most privacy shields also add a degree of protection from the elements. In addition to the peace of mind you’ll get from a private spa experience, adding an enclosure, covering, or screen can keep your hot tub out of the elements and looking its best for years to come. Do you need a place for people to get together and hang out? Or maybe you want to create an environment of relaxation where you can sit back and enjoy a private at-home-spa experience? You may interested in incorporating a spa surround, enhanced decking, or built-in seating element around or near your hot tub. Key takeaway: One of the perks of designing a surround or enclosure is the added storage it provides. Remember to factor in location of filters and other semi-annual maintenance needs when designing your ideal hot tub privacy design. Looking for more ideas for creating your perfect outdoor space? 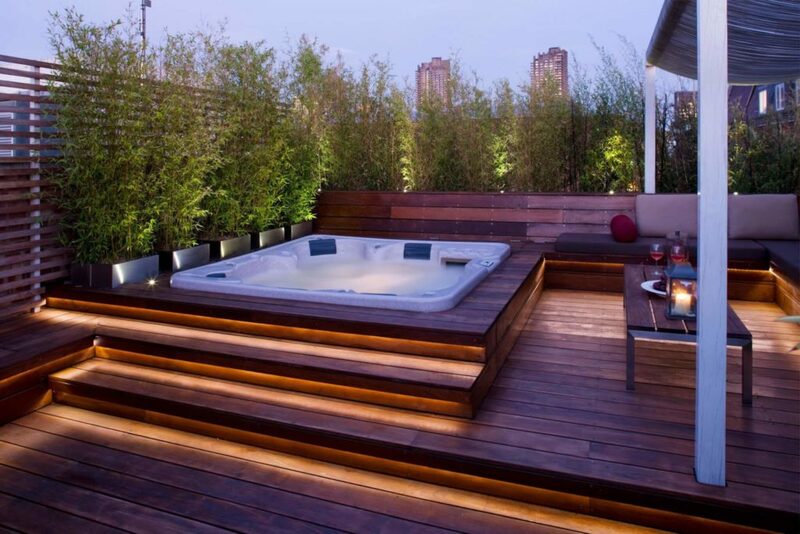 Check out our article, 63 Hot Tub Deck Ideas: Secrets of Pro Installers & Designers. Seems simple but one of the keys to enjoying your hot tub is being able to get in and out easily and safely. There are many creative ways to install your spa completely or partially in the ground for easy access and many accessories like steps and hand holds that will make entry and exit safe and simple. Here are a few of our favorite spa steps and accessibility ideas. Let’s face it, we’re not all the same size. If you find yourself toward the shorter end of the spectrum you may struggle finding a comfortable spa seat that doesn’t make you feel like you’re swimming. Modular spa cushions come in a variety of sizes and configurations. These accessories can add some extra height for better alignment with the jets and comfort while soaking in the hot tub. They’re great for kids as well. 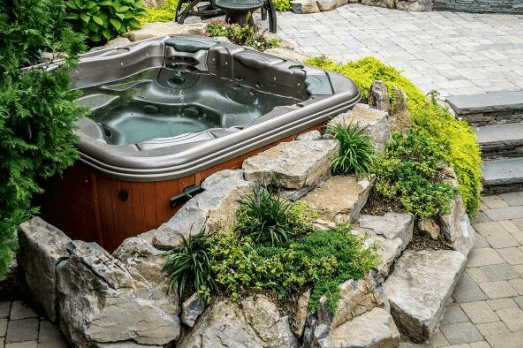 There are a variety styles and designs to choose from, and your hot tub dealer can help you decide which type of cushion best fits your needs. Although most quality hot tubs come with very comfortable attached pillows, you may also want to opt for a supplementary set of hot tub pillows for additional cushioning and comfort. Key takeaway: Boost your spa experience by keeping a couple of extra sinking spa cushions around for shorter individuals and kids. For tips on the best way to maintain and care for your hot tub, check out our helpful infographic: How to Clean Your Hot Tub in 30 Minutes Per Month. When it comes to hot tub ownership, safety is a big deal. No matter how careful you are, accidents can still happen. Help protect your family, friends, and even yourself from injury by taking these precautions. In addition to the safety accessories below keep in mind infants and young children, especially if they are not your own, should never be permitted to enter a hot tub or the area around a hot tub. When age appropriate children are in the hot tub, the temperature should be reduced to 100 degrees and should not be in the hot tub longer than 20 minutes. Here are a few recommended safety accessories you may want to consider for your spa. A locking spa cover or cover with locking clips is simply a must. In addition to helping you keep your spa clean and energy efficient, your hot tub cover is your first line of defense. Make sure that your spa cover latches firmly and locks. This will keep small children from accidentally entering the spa. A locking spa cover will also keep uninvited larger children, teens, adults, and even animals (yes bears sometimes like a soak) out of your spa at times when you may not be home. One of the most convenient accessories, which we highly recommend, is a cover lifter or lift assist as they are often called. These devices make lifting your cover off the spa simple, even for one person. They also hold your cover out of the way while you soak. When positioned correctly, your cover resting up out of the way on the cover lift can even act as a privacy shield. It’s always best to create clear guidelines for using the hot tub with your friends and family. Some signage around the spa can help to make the rules a little more clear if you’re not always around. You may want to create signs reminding people about the safety hazards inherent with water and chemicals as well as reminders to avoid drinking alcohol before or while soaking in a hot tub, which can increase your risk of a passing out and drowning. Signs may also include a warning to avoid using your hot tub or swimming pool during a thunder and lightning storm or any other extreme weather situation. Even though such safety signage isn’t generally required for private hot tubs at your own place of residence, it’s never a bad idea. It can even help you remember to be on your best behavior. Install gates and locks around your hot tub area to keep children from entering when an adult is not present. When the spa is not in use, remember to also keep the hot tub covered and locked to prevent children or pets from falling in. In some municipalities locking gates are required by law. You can learn more about safety guidelines by checking out this article by the U.S. Consumer Product Safety Commission. Help prevent falls and other serious injuries by installing handrails and anti-skid treads to steps and other areas on the deck. As you survey your hot tub and its surrounding area, keep a lookout for any dark space where someone might trip or fall. If there are any dark or less visible corners, install exterior lighting to illuminate those places and ensure people don’t miss a step and injure themselves. As mentioned, hot tub covers serve as a key safety feature. You’ll want to look for a cover that has a high foam density and thickness to ensure security, as well as protection from Mother Nature. You should also choose a cover with the correct measurements, so it fits your hot tub and doesn’t leave gaps which can turn dangerous and waste energy. And of course, always take a moment to ensure your cover locks properly. Key takeaway: Be aware of the areas around your hot tub where accidents may occur. Add railings, signs, exterior lights, and a durable locking cover to keep the hot tub ownership experience free of incident. Your hot tub is relaxing and therapeutic, but that doesn’t mean you can’t have some fun as well. There are a variety of hot tub accessories that can help you get the party started. The right music added to your relaxing hydromassage can really help you unwind at the end of the day. Integrated audio systems are an excellent way to enhance your hot tub experience. Bullfrog Spas offers an Elite Audio System which is designed to optimize your personal relaxation by surrounding you with rich sound and giving you control over your music while relaxing int the spa. Floating water-proof speakers are another way to enjoy a smooth spa sound experience. Simply cue up your favorite playlist on your smart phone, tablet, or digital music device, connect to the speakers via bluetooth, sit back and relax. Key takeaway: When choosing the best wireless or bluetooth speakers for your hot tub, take a moment to consider the pros and cons along with the set up. Learn more by checking out this Wireless Speaker Buying Guide. For those who have children, providing games and hot tub toys works to break the ice (or stop the fighting). For entertaining your adult friends during backyard get togethers, a simple deck of water-proof playing cards is a must for a little hot tub poker or any other favorite card game. Most of your favorite pool toys and accessories like floating noodles, pool ping pong, floating beverage boats, and even pool basketball hoops will work in the hot tub as well. Some favorites hot tub games include Sink the Battleship and Keep Away. Sink the Battleship is simple but always fun. Grab two cups, one for each team, and take turns pouring water from your hand into the the opponents empty cup. Whichever cup sinks first is out of the game. With Keep Away, split up into two teams and grab any objects that float, like rubber duckies or ping pong balls. The goal of the game is to have your object touch someone on the other team before their object touches anyone on your team. The only catch? You can’t use your hands. Key takeaway: If you want more hot tub game ideas, there are dozens of fun family-friendly activities parents and kids alike can enjoy. In addition, waterproof card and board games are perfect for entertaining in the hot tub. Many of your favorite strength and flexibility exercises can also be done in the hot tub. Exercising in the spa can help to minimize impact on joints and offers the benefit of less muscle stiffness. One of the easiest fitness accessories to use in the spa is a set of standard resistance bands. Nearly all the resistance exercises you might do out of the water can be accomplished in your own spa. Several of the hot tub toys mentioned above can also help you get in shape and enhance a low-impact exercise program. Grab some pool noodles and press them under the water in a variety of motions to work different muscle groups without the additional stress to joints. Before starting any new exercise program, consult with your doctor or health professional. Key takeaway: Incorporate various exercise accessories in your hot tub or just repurpose some of your hot tub toys. Your hydrotherapy experience can become a viable exercise program. One of the most enjoyable aspects of hydrotherapy is incorporating relaxing scents, sights, and sounds. There are a variety of fragrances available by way of specialized spa salts. With many appealing scents to choose from, these sweet smelling substances create the ideal hot tub experience without messing up your pH levels, alkalinity, or harming your hot tub equipment. Skin softening water conditioners are another excellent addition to help keep your skin moisturized and soft while soaking in your hot tub. Before using these, check your pH levels and alkalinity to confirm your water is properly prepped. Key takeaway: In addition to aroma salts, drop in a few drops of your favorite essential oil into the water to help you relax. While you’re relishing in the comfort of your hot tub, remember to stay on top of maintenance, including water care. Many people put off the task of maintaining their hot tub due to time constraints and procrastination. However, with the proper care and upkeep, you can keep your hot tub and accessories free of dirt, debris, and anything else that can damage them. There are a number of accessories available to help you maintain your hot tub. A hot tub chemical floater, usually used in conjunction with bromine sanitation regimens, is one of the simplest ways to ensure your sanitizer levels are correct. Another simple accessory to help you maintain your spa is a hot tub scrub brush. Wash your hot tub walls and floor with a hot tub brush that is slightly curved to go around walls and get those corners. While you’re keeping your filters and jets clean, you need to also stay on top of your water chemistry. When it comes to hot tub chemistry, there are a lot of aftermarket and OEM options on the market—chlorine, bromine, salt water systems, UV light sanitizers, and other alternative water systems. As you do your research, take some time to weigh the pros and cons with each option. The more you know going in, the better you can anticipate how much work will go into your hot tub water care. For example, salt water systems are a hot topic right now and one some people lean towards to get away from using chemicals. However, keep in mind these are not necessarily without some maintenance and upkeep. Several apps help stay on top of your hot tub maintenance. Check out this list from Swim University on apps for pool and hot tub care. Key takeaway: Keeping your hot tub clean and clear of debris is important, but it’s equally important to test your water. Maintaining proper pH and alkalinity levels is critical to keeping your water clear and avoid any skin irritation. A hot tub is a place to relax and reconnect with your family and friends. By incorporating hot tub accessories into your design, you can create a space that fits your lifestyle. Above, we’ve listed some accessories and ideas for you to use with your own hot tub. Take two or three and improve your hot tub experience today. Did you enjoy this post? Share it on Facebook, Twitter, Instagram or Pinterest. Have some other ideas? Tell us about them in the comments below. I RECENTLY PURCHASED A BULLFROG SPA FROM LEISURE SPA/POOLS IN COLUMBUS GA AND IT WAS THE WORST THING I’VE DONE IN A LONG TIME WHAT A WASTE OF MONEY THAT COMPANY IS HORRIBLE WILL NOT RECOMMEND ANYONE TO PURCHASE A SPA FROM THEM. Thanks for the feedback and bringing this to our attention. It’s important that our customers have a great experience when purchasing our product. This includes the experience you have with the dealerships that sell our brand. We’re using this as an opportunity for training and can assure you we will discuss this with this business. If you would like to provide the specifics of this situation (if you have not done so already) please email them to info@bullfrogspas.com.